One of the guys on the Thing forum was saying that his Defender was the far superior off-road machine. Perhaps he was right? Darn. I couldn't get it to embed in the page. Maybe someone else can do it for me. So the trailing arm broke, I thought the pivot bolt came out at the beginning. How far did you guys have to tow it? We were only able to tow it about 150 yards. 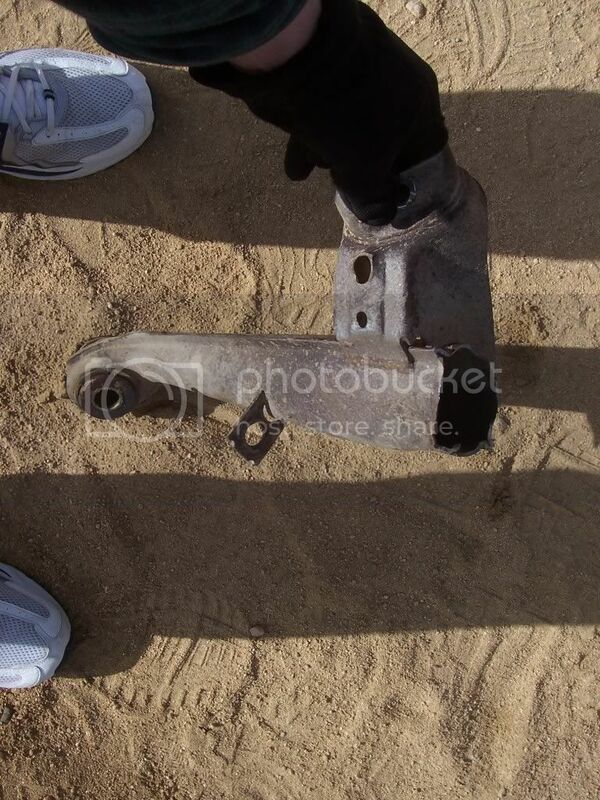 Get this: We broke down in the middle of the desert, but were only about eight miles from a VW junkyard! One of our guys found the owner, and he sold us a bug trailing arm and another guy had a Type 4 CV. We replaced it all right there in the dirt. It was great teamwork, and lots of laughs (as you can tell from the video). Looks like the makings of a trophy for the next person who brakes the biggest part and I sure am glad I have boxed in arms. I would have had you covered if you broke down while we were still with the main group! That's a 10 minute fix and I had a sleeve on board we could have used to strengthen it and make it better than stock! [ Go to page: 1 ...	7, 8, 9	] 133 Mykul 154772 New to Bajas?